The ZOPA is a range of rates over which you can expect to lend out money over the next 7 days. The bottom of the ZOPA is where you will lend out your money as fast as possible by participating in all loan applications. The top of the ZOPA is where you will lend out your money at a slow rate while still participating in some loan applications over the coming week. The rate you choose in each market should give you a return you find acceptable after fees and possible bad debt regardless of what the rest of the market is doing. But, if you select a very high rate that is above the Zopa in all markets, you may not lend money and earn no interest at all. To work out both key figures we will use 1 month of actual loan applications and disbursals. The reason for using 1 month rather than 7 days is to smooth out the monthly funding cycle and to produce a large data set to improve statistical significance. 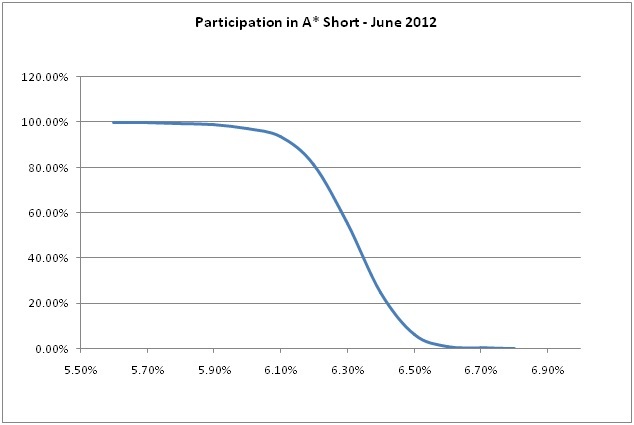 This data will be used to generate a participation curve like the one shown on the chart below. The horizontal axis of this chart shows the lending offer rate and the vertical axis the percentage of all loans (in A* Shorter in this case) the lending offer would have participated in the last month. It’s as simple as that! A few small changes need to be made to the lending offer page and to the matching queue to make this new method work better and I’ll talk about that in my next post.